Hey everyone, we just got back from a week-long trip with my husband's family to Melbourne Beach in Florida! While down there, we rented a beach house and pretty much lounged on the beach all week. It was a lot of fun and very relaxing. Avery did a great job and really seemed to like the beach...darn it, one more vote for the beach (I love the mountains!). Now although I am a mountain fan, the beach was great for our large family because there was lots to do right in our backyard, like: swimming, laying out, building sandcastles, going for walks, and even skateboarding (a must-have for Brandon!). Here's some pictures of the fun we had on this trip...which was actually our first trip as a "family"! All smiles on the drive down to FL. Sunrise on the first morning. Trying the water for the first time. Went much better the second time around. Enjoying the beach with Dad. All smiles for Dad back at the beach house. The view from the backyard of our house. Back at the beach...she's starting to like this ocean stuff! Better watch out for the wave! Brandon did some surfing while at the beach. Rockin her "Baby Banz Sunglasses"
This sun hat was our favorite accessory on this trip! Now as you saw from the first picture above, we drove all the way to Florida from Missouri. It took about 2 days...8 hours of driving the first day and then 12 hours the second day. Surprisingly, Avery did an awesome job. We made sure to stop and take some breaks so she wasn't strapped in her car seat for really long periods of time. Also, I would take her out her car seat to nurse...I know that probably wasn't the safest thing to do, but it would have taken us a week to get to Florida if we stopped every time she was hungry. I think the drive also went so smooth because she sleeps quite a bit (as she's only 2 1/2 months old). But I have a feeling a long drive like this may be a bit more difficult as she gets older and wants to be moving around! 1. Learn how to change a diaper in your lap. Whenever we would stop for gas or at a rest area, I would change Avery's diaper and I did it usually in my lap. I barely wanted to use those not-so-clean and definitely not-so-green bathrooms, so there was no way I was changing her in there! By the way, you might get ready for lots of bowel movements, as Avery had several. I'm not sure if it was something about the movement of the car or just the new surroundings, but Avery had 3-4 BM diapers on our drive down and several more on the drive back. Now this could have been frustrating considering I had to change all these diapers in my lap, but I chose to laugh about it and you can bet that by the end I was one backseat-diaper-changing rock star! I think her "trip nickname" should be "Lil' Poopie!" A diaper change in mom's lap- good times! 2. If the baby gets fussy, roll down the window. The only time Avery really fussed on the trip was when she was tired and needed to fall asleep...but didn't want to. Our solution: roll down the windows. There must be something about the sound of the air blowing and actually feeling it on her face/eyes that really helped to ease her to sleep. Another thing I did was to gently shake her car seat, which created a vibrating kind of motion that seemed to help even more to get her to sleep. Last, it helped sometimes for me to undo the shoulder harness portion of her car seat seat belt, still leaving the lap band fastened. Sometime those shoulder straps would just make her even more upset for some reason. Now I know it's probably not the safest thing to do, but this blog is real life, so I'd be lying if I said I just let her sit all buckled up in her car seat for two days. This is just one thing I did to help make the trip go much smoother for her and for us, and sometimes you just do what you have to do to get by. Anyone else have some tips that have worked for you in the past? Post below! Oh no! She's not happy! Let's roll down the window. 1. We drove to Florida. Aside from the fact that I had no desire to try and fly with my 2 1/2 month old, driving down to Florida was a great green option for us. Here is more about how driving (in a fuel efficient car) is more eco-friendly! Instead we chose our car that gets the best gas mileage, a Dodge Caliber to take on our trek down to Florida. Gotta love the view of palm trees out your windshield. ocean...wouldn't mind waking up to that everyday! Just one of our big loads of items to be recycled. How about a shot...of green smoothie that is! 5. Cook our own meals, as opposed to eating out. This is an easy one for me since most restaurants do not have many gluten-free vegan options on their menus. So what do I do since I can't eat out? Sit at home and eat celery sticks and Larabars all day? Heck no! I brought my always-growing recipe folder and made some of my favorite meals. On our way down to Florida we stopped at Whole Foods and stocked up on snacks, produce, and pantry staples so we could cook and eat just like we do back home. Only this time I had the help of my niece, who did a great job with prepping and cooking the food with me...thanks Olivia, you rock! "Meat-less Meatloaf and Mashed Sweet Potatoes"
6. Pack my own snacks and meals for the road. Want to save some money while traveling and reduce unnecessary packaging and waste? Pack your own meals and snacks! One of my favorite ways to do this is to make something for dinner the night before we leave that makes a lot of leftovers that way we're all set for lunch the next day. All we have to do is keep the leftovers in a cooler, and then warm them up at a gas station and there you have a cheap, green, delicious, and quick lunch! Love it! We also stock up on some yummy, healthy snacks for the road so we don't have to buy them at the gas station or stop at a grocery store along the way. Here's one I found for this trip that was delicious: "Tres Bean Dip" by Eat Smart. It tasted great with some organic corn tortilla chips. Aside from this, Larabars, fresh fruit and baby carrots were also a must for our two-day drive! 7. We enjoyed the wildlife in our own backyard, instead of going to animal amusement parks. Now although most people associate being a vegan solely with food, for me, it also extends into other areas of animal rights...one of those being to avoid "animal amusement parks". If you've ever seen the documentary The Cove or watched Whale Wars, you know that being trapped in a big pool and treated like a spectacle is no way for a wild animal to live it's life. I can see the merit in those animal amusement parks because you can learn a lot about wild animals that you would never have the opportunity to see otherwise. But I think we have to think twice about if that's really the best home for the animals. Read more about the dangerous effect of captivity on animals such as dolphins here. So on our trip we saw fun critters like this lizard and crab below right in our driveway and backyard, and although I didn't get to touch them or watch them perform a show for me, I enjoyed watching them from a distance and letting them stay at peace in the their own surroundings. So that wraps up my recap of our first family vacation to Florida and how I tried to maintain some of my green-ness! Do you have any favorite ways to stay green while vacationing? Post below! Glad you had a wonderful time! Oddly enough, your crab and lizard pics reminded me of home! My nephew has 2 hermit crabs and a niece has a lizard, right here in MN! 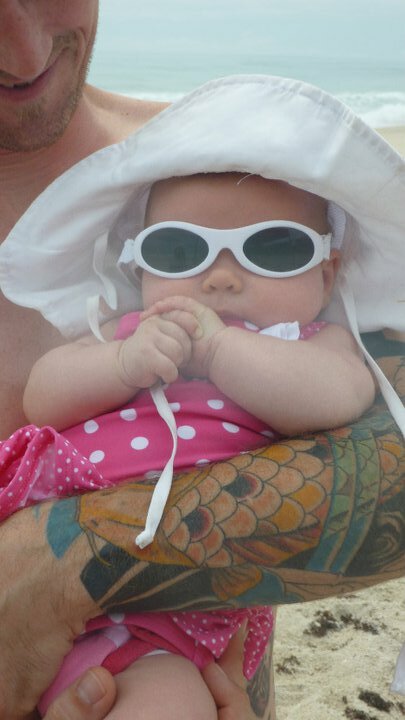 LOVE Avery in her swimsuit and hat! And can you look more amazing after recently having a baby?! I love how Avery's early life is being documented. She's going to love seeing it one day, it's really lovely! Glad you liked the pics Tina. Too funny about the animals down there being similar to up in MN! Yeah, seeing Avery in the swimsuit and hat was one of my favorite memories of the trip. Thanks to her grandma, we had 3 swimsuits to choose from-I think it's safe to say that girl is spoiled! Hi Ashley its olivia. so yesterday i watched no impact man and it was awesome. i loved the scene when they went to the farm for their "vacation". can't wait to see you and avery again in a few days. we are leaving mon and stopping for a day in atlanta on tues. so we will get there on wed.